In 1995 the Genesis project had been successfully rolled out in Europe and the US and I had a moment for a breather. Jim was scheduled for a business meeting in San Juan, Puerto Rico, and I decided to go along. We agreed to take some extra time at the end of the meeting to tour the rest of the island. The days that he was in his meeting were a complete veg-out time for me. I stayed in the room and alternated between needlework and watching old movies on TV. After two years of running on overdrive it was bliss! So blissful, in fact, that I realized how burnt-out I had become. After this trip I asked to be removed from the project. Someone else got the trip to Australia to bring the final support center online. I can't say I felt guilty because all the hardest work had been done and the last implementation was uneventful. I know that I have other pictures from our trip around the island. The only ones that I've located so far, however, are of San Juan. They will have to do until I find the others. In 2017 Hurricane Maria devastated Puerto Rico. I've wondered how much of what we saw survived. There are a couple of ways to follow us on our trip. I've tried to make the narrative a complete summary, but I've used many links to other web sites to provide additional details and sometimes pictures. You can either stick with the basic narrative or explore the various links. At the time this album was created the links were all valid, but the WWW is in constant flux and that can change. If you encounter broken links, please send us some email. You will note that many of the links are to articles in Wikipedia. Regardless of what you think about that source, the benefit is that links rarely disappear. This is not the case with touristic and university sites that are constantly, it seems, being reorganized. 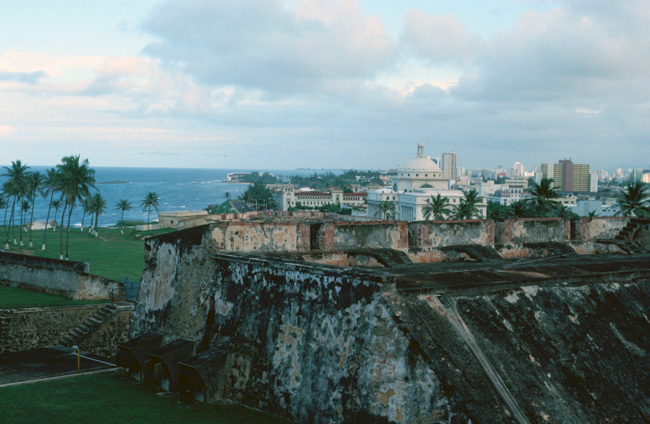 I had been to San Juan once before. 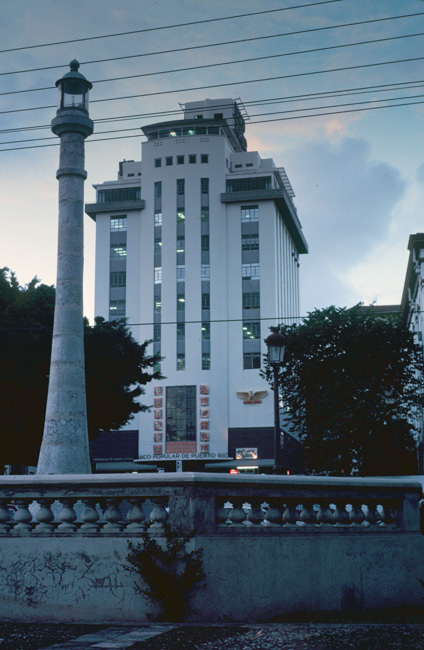 Banco Popular was one of Tandem's customers. It had been having some very elusive data communications problems between the Tandem systems that ran their ATMs and their IBM mainframe. Our best technical talent in the Reston, VA, System Support Group and beyond had been unable to resolve these problems. The missing link was capturing the right debugging data at the exact time of the failure. It eventually became politically expedient to send the manager of Reston SSG, that would be me, down for a powwow with the bank's managers along with their "local" support analyst from Miami. I figured that I was to be the sacrificial lamb. As it happens, however, the problem occurred during the first night I was there. Bill, the local analyst, pounded on my hotel room door and the two of us sat on my bed in hotel-issued bathrobes talking to the system operations staff. I had been briefed on the specific commands to use to start the data capture, but based on my long-ago IBM background I also gave some instructions on commands to use on that system. The luck of the Irish was with me, and it was miraculously the correct sequence of operations on both machines needed to reproduce the pesky problem. We transmitted the captured data back to Reston for analysis and I became the heroine of the hour. When we going into San Juan one afternoon on this trip, I couldn't resist snapping this photo of one of the Banco Popular branches. Or, as we called it, Banco UN-Popular! We stayed at the TravelLodge, which was NOT on the beach, but it wasn't that far away. We did manage to go swimming one afternoon. It was a beautiful beach, but the surf added up to lots of sand in the swimsuit! The hotel is now operated by Wyndham. A picture can be seen at the link. The area where we were is called Isla Verde. 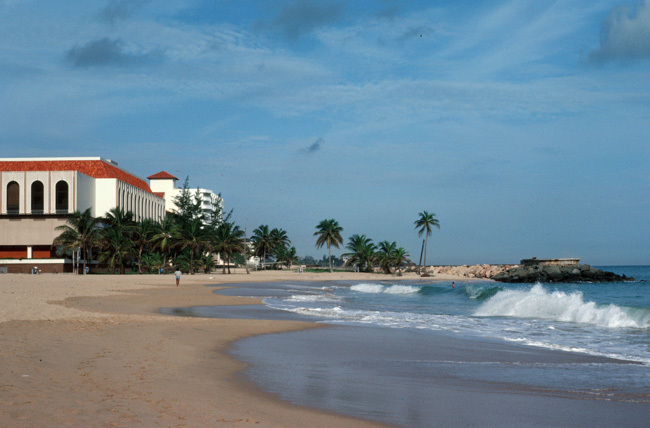 This is a view of the beach area from the other side of the point in the picture above. 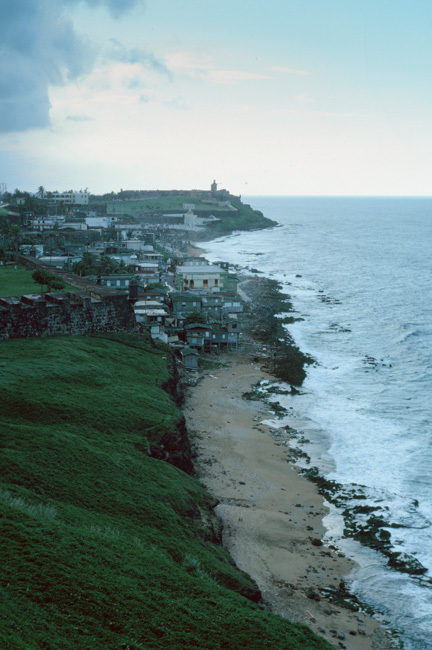 When I had visited Puerto Rico as described above, my hotel was located right on a similar rocky point. My window faced the sea and I could hear the waves all night. I could never decide whether it was soothing or irritating! 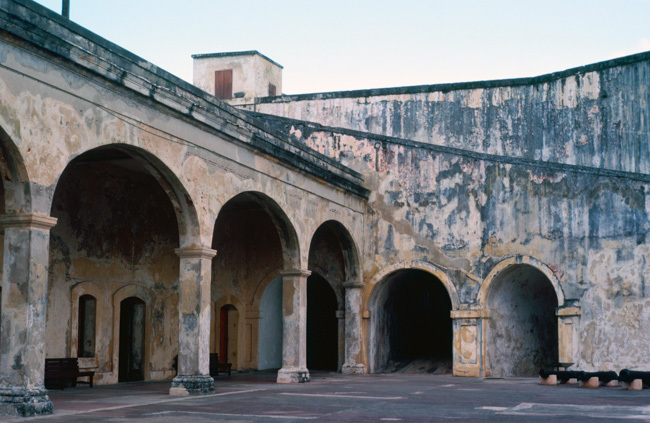 We went into old San Juan a couple of times. The first time we took the public bus. 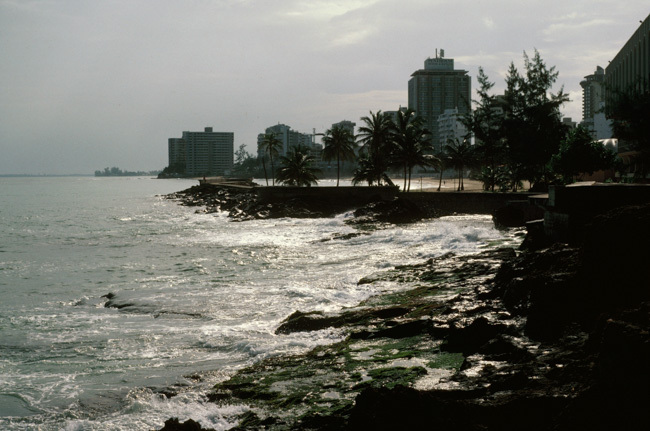 As the info at the Isla Verde link says, there are some rough neighborhoods between the resort area and downtown. Although we didn't run into trouble we decided to take a taxi back! We are standing in Castillo San Felipe del Morro, on a promontory adjacent to the city. It was an interesting place to prowl around. It was still an active military post until after WWII. I no longer remember what time of year we visited, but it clearly wasn't the high tourist season. Everything was pretty deserted. I wouldn't want to scale these fort walls under fire! 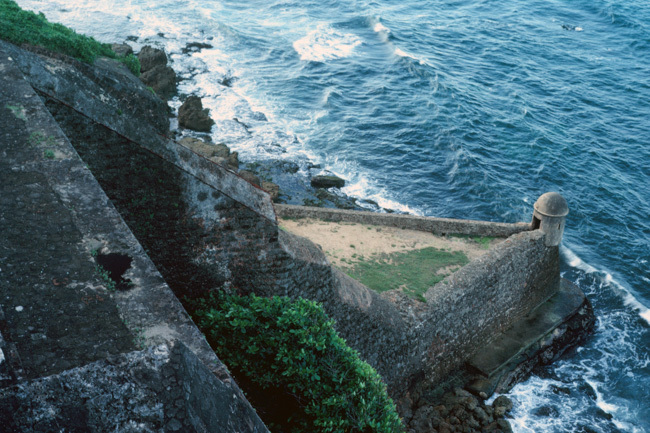 The fort from farther down the coast. I don't think that the houses down by the shore were the high-rent part of town. I can't imagine what Puerto Rico looks like now after hurricane Maria. I've seen the devastation that Katrina left and from the news reports this island was hit harder. (I'm writing this in 2018.) We know someone here who is from St. Thomas, which got hit TWICE last summer, and he says the devastation there is unimaginable. 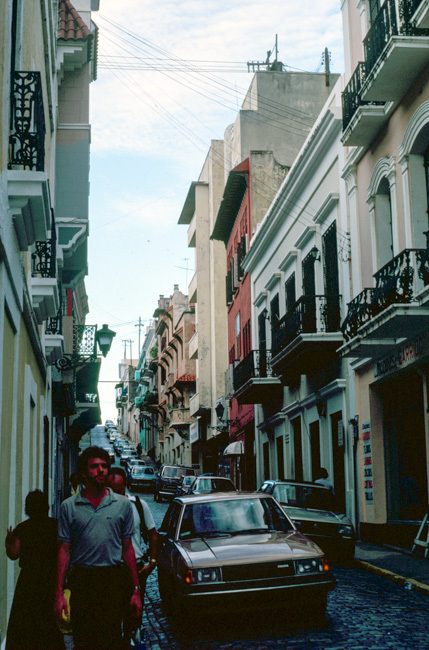 A typical residential street in Old San Juan. 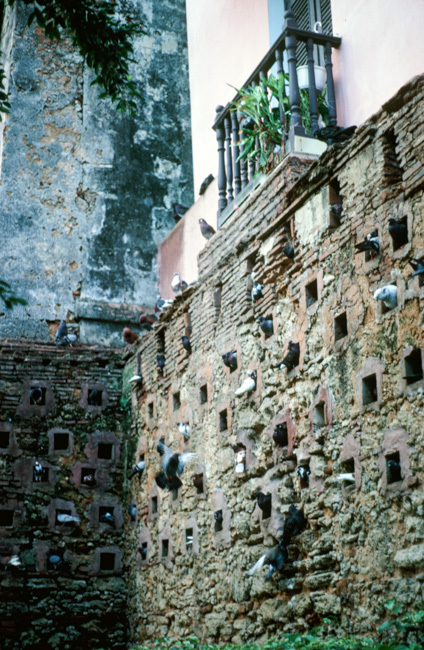 I was fascinated by this "pigeon condo." I'm not a big fan of pigeons myself, but whoever built this must have been! 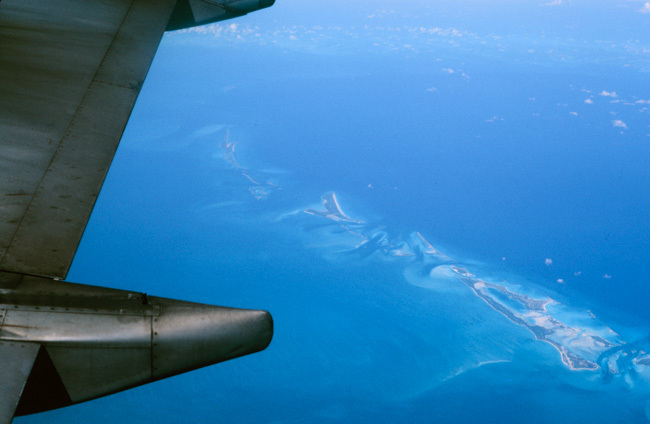 On the way back to Miami we flew over some beautiful islands. I hope to locate the rest of my pictures someday. We really enjoyed our time driving around the island and staying in small inns. We visited a coffee plantation and got to nibble on fresh coffee berries. At one town we took a night-time boat ride and got to see the guides scoop phosphorescent water over the decks. Wow! I think we may have been the only mainland tourists in the area.